A recent episode of ABC’s ‘Grey’s Anatomy’ started me thinking about what to say when someone’s loved one dies. It’s something families who lose someone to mesothelioma are forced to deal with every day. There’s a thing we say when someone dies. We say it to the…family. We say, “I’m sorry for your loss. It’s a pat little phrase, and an empty one. It doesn’t begin to cover what’s actually happening to them. It lets us empathize without forcing us to feel their devastation ourselves. It protects us. From feeling that pain. That dark, sinking, relentless pain…the kind that can eat you alive. Personally, I think the words “I’m sorry for your loss” are a good choice of what to say when someone dies. It indicates you are acknowledging their pain and that you feel for them. In fact, this phrase made the list of ‘The 8 Best Things You Can Say to Someone Who Is Grieving,’ written by Christy Heitger-Ewing and published a few months ago in The Huffington Post. This is good advice. I know when I have lost people close to me, often the greatest gift is someone to just sit with you or grab a cup of coffee with you. Learn from others by joining our monthly online support group run by a licensed mental health counselor. When a friend of mine was forced to say goodbye to her dad, who died from lung cancer, I recall another friend asking me for ideas of what we could do for the grieving friend. The second friend confided in me that the only loss she had gone through was losing her cat. I surely hope she never mentioned that to the girl who lost her dad. This list is perhaps even more important than the first list I’ve included. 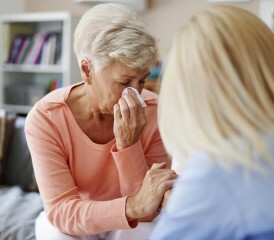 When someone has died, you do not want your words to add to the pain their loved ones are feeling. We can’t get too close. If we felt even a little of the love and the joy and the hopes that (they) are saying goodbye to…we’d never be able to function. So we say, “We’re sorry for your loss.” And we hope it offers something. Some little bit of support. Some bit of peace. Some bit of closure. Something good. Some little piece of beauty in the midst of someplace dark. An unexpected gift…Just when it’s needed most.